Please don’t judge me. I know, I know…pulled pork once again. What can I say? There are literally only two of us living here (if you don’t count Cilantro — we try to keep him as far from people food as we possible can). A pork shoulder goes a LONG way, and it’s not as easy as you may think to find a small one. I love it, but like I mentioned yesterday, I’m pretty much over it now =). It was great while it lasted though! I PROMISE you that there will be a different kind of recipe up on Thursday. So we’ve been quite busy around here. Zach’s parents get here on Saturday, and Sunday we have a little road trip ahead of us. We are heading back to some of my favorite spots in the country: Jackson, WY being one of them. As much as I am looking forward to this 9 day car ride, there is so much to do! Now does it make sense that I cooked a pork shoulder over the weekend to feed us for a week?! It does to me =). Like I mentioned yesterday about my recipe app not loving the fact that I was trying to add a gazillion ingredients, here is my BBQ sauce recipe once again. Give it a shot if you’d like or just use the store-bought stuff. I promise, I will not be offended =). For the barbecue sauce, heat the olive oil in a large saucepan over medium-high heat. Add the onion and cook for 4-5 minutes or until the onion is tender. Add the coffee, ketchup, cider vinegar, dijon mustard, brown sugar and honey. Whisk the ingredients together until smooth. Season with salt, pepper and chipotle chili powder, then add the tomato paste and whisk to break up any clumps. Bring the BBQ sauce to a boil and then reduce the heat to a simmer. Simmer on low for 25-30 minutes. Transfer the BBQ sauce to a large bowl to cool slightly. We are going to continue down this road of the deliciousness that is Ska Brewing. No, I’m not going to pair with the Ten Pin Porter again, but instead go with their milk stout. Ska Brewing Steel Toe Stout is just divine. I have to be honest. The first time I tried this brew was literally last night, but it was just so perfect with the pizza that I had to pair it. I was pleasantly surprised how much I loved it. I tend to be a snobby stout drinker, and it has to be pretty fabulous for me to absolutely LOVE it. This stout is perfect. It is full-bodied and great with BBQ (or in BBQ!). It’s equally as great with desserts. Try it with your next brownie sundae…or ON TOP of your brownie sundae! Hey, now there’s an idea. I know it’s only Tuesday, but hey we are closer to the end of the week than we were yesterday! So, yay! Have a great night everyone! 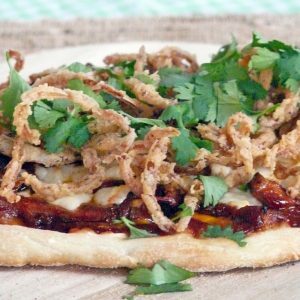 Yup that''s right: BBQ Pulled Pork Pizza and you are not going to want to miss this one! For the pulled pork, preheat your slow cooker (4 hours on high or 6-8 hours on low). Brush the mustard onto the pork shoulder roast and set aside. In a small bowl, whisk together the ground coffee, chipotle chili powder, garlic powder, cayenne pepper, brown sugar, salt and pepper. Rub the spice mixture onto the mustard-coated pork generously and on all sides. Add the onions and chicken broth to the slow cooker and place the pork shoulder on top. Cook for 4-8 hours (depending on your slow cooker) or until the meat is tender and the pork is falling apart. Remove from the slow cooker and let rest for just a couple of minutes. Either with two forks or your fingers (be careful it's hot!) pull or shred the meat. Add the pulled pork to a large bowl and add 16 ounces of the BBQ sauce. Toss to evenly coat and set aside. Preheat your oven to 450 degrees and situate an oven rack between the middle and the very bottom notches of the oven. Place your pizza stone into the oven while it's heating up (if you are using one -- you could also use a baking sheet although be sure that is greased). Now you will begin shaping your dough balls into 8 inch circles (about 1/4 inch thick). Roll out if necessary. Brush the 3 pizza dough circles with BBQ sauce and top with grated cheddar cheese. Top the cheese with pulled pork and then top with queso fresco. Slide one of the pies into the oven and cook for 20-22 minutes or until the crust is golden brown. Repeat this step for the rest of your pies. While your pies are baking, make your fried onions. Heat the oil in a large stock pot over medium high height to a temperature of 350 degrees F. Coat the sliced onions with buttermilk, and let soak for 5-10 minutes. In a large bowl, whisk together the flour, salt, black pepper and cayenne pepper. Transfer the onions to the flour mixture and then add them (in 2 batches) to the hot oil. Cook for 3-4 minutes or until they are golden brown. Remove from the oil and transfer to a paper towel-lined plate. Season with more salt and pepper. When you have removed the pizza from the oven, top with the fried onions and sprinkle with cilantro. Serve immediately and enjoy!